It was good to get away from Paris. 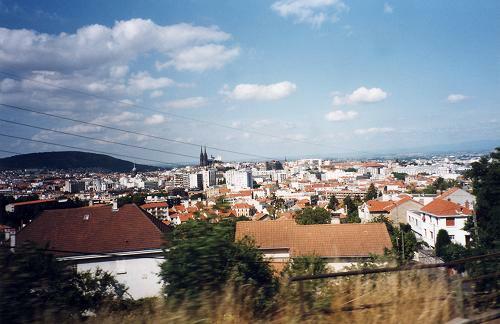 Clermont Ferrand looked fairly ordinary but the countryside around looked good. Volvic seems a very prosperous place - built, not on sand, but water. Got up late and got out at 9:30 without waking our somnolent friend. Had "breakfast" at a café on the Place Republique. Here A discovered pain au chocolat. He had two! We then walked to the Pompidou Centre and back to the Hotel, getting sandwiches for lunch on the way. We checked out at 11:30. Our somnolent friend was gone. The hotel was filling up as we left. 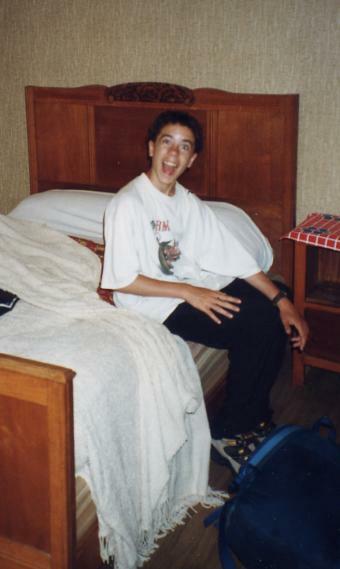 The guests all looked as if they had been sent from the Youth Hostel. The only hotel service is reception and room cleaning. We took the Metro to the Gare de Lyon and are now speeding through France at about 100 mph. 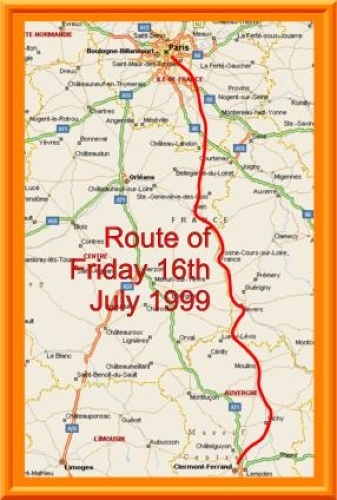 Our route was through Melun, Montargis, Gien, Nevers, Moulins, Vichy and Riom. Our accommodation is like an old fashioned BR train, with a corridor and compartments. There are 8 of us in our compartment - the train seems very full. Fortunately it is air conditioned - it looks warm out there. 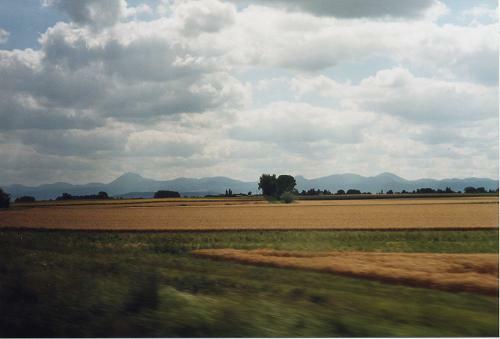 Bits of the train go to Le Mont Dore and Aurillac. At one point we went along the banks of the Loire. Coming into Riom we saw the Chaine de Puys, including the Puy de Dome - it looks very high. We got in 15 minutes late, at 16:25, but it has been a nice journey. At Clermont Ferrand station we bought tickets to Volvic and a Telecarte so that we could phone C. The train journey to Gare de Volvic is short but spectacular. It is hard work for the engine, uphill all the way, but there are spectacular views across Clermont Ferrand. The black mass of the cathedral is very evident. A large part of the way seems to be through the better suburbs of the city. The platforms for non-TGV trains are not obvious when you get to the Gare de Lyon. They are to the left and forwards (looking along the tracks out of the Station). Despite being a second class citizen the train to Clermont Ferrand was very impressive. But after that we had a long 45 minute walk down into Volvic. It is a steep walk along a fairly busy road without a pavement. Not nice. In the town, which looks very pretty, we quickly got a room for 160F at the Hotel du Midi. Pretty good, 2 big beds, shower, bidet, sink, toilet down the stairs. We showered, did the washing and went exploring. Lots of shops - nice little town. The Hotel du Midi looks the poor relation of the two hotels in the town centre. We will eat in the other one later. 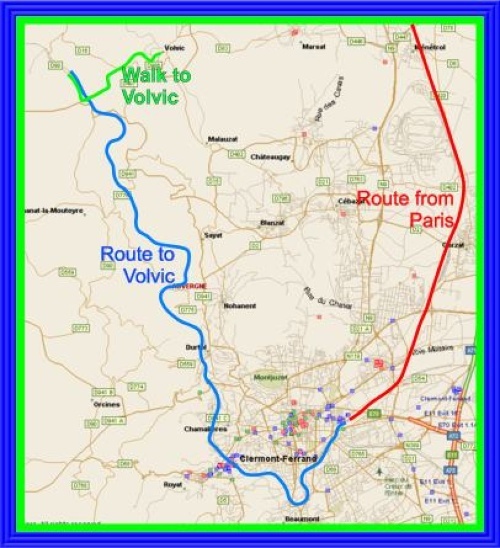 It turned out that it would have been better to have walked from the Gare de Volvic. But the first train on Saturday was about 6, the next being at 10 or 12. So a reasonable start time for Saturday meant getting to Volvic on Friday. I’m writing this as we finish our meal at the Hotel du Commerce. I’m on the 110F menu, A on the "Enfant". He couldn’t face a menu with both snails and frogs legs on it. There’s a Spanish folk group performing in front of the church - lots of "Hobla, Hobla!" Quite pleasant as it was taking a long time for my sweet to arrive. A went and phoned C and, after paying, we both went and phoned her. All is well at home. The local rock is a black volcanic rock of andesitic composition. There is lots of evidence of skilful quarrying and masonry. The Telecarte worked very well, easy to use.